This is another one of those recipes that I’ve been meaning to share for a few years now! ???? Eeek! 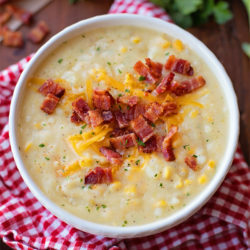 It’s been a family favorite since the day we first made it… and it’s one of the few soups my husband requests time & time again (aide from this soup)!! 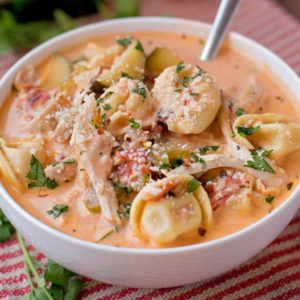 This Italian chicken noodle soup is creamy, chunky & packed full of flavor… plus it’s a breeze to make. Did I mention that you can use any short pasta you want, or even tortellini? Yesss! P.S. usually we use pulled rotisserie chicken for ease, but last year we tossed in some Thanksgiving turkey leftovers and it was just as delicious. Anyway, back to the recipe, just chop your veggies, saute them, then add in the tomatoes, chicken and seasonings. Simmer for 20 minutes, then add the pasta and cook until it’s al dente. Remove the pot from the heat, stir in the cream and parsley and then serve it up! Garnish with lots of cheese and enjoy! 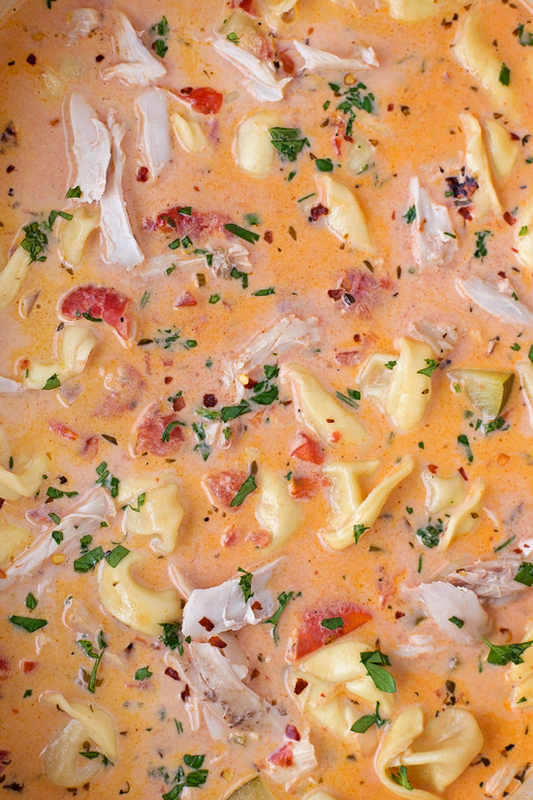 This soup is a family favorite, one that we keep making over & over again. 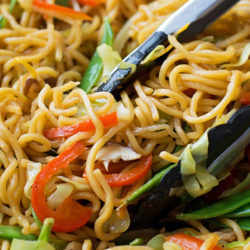 It’s kid-friendly and makes enough to feed a crowd or to enjoy as leftovers. 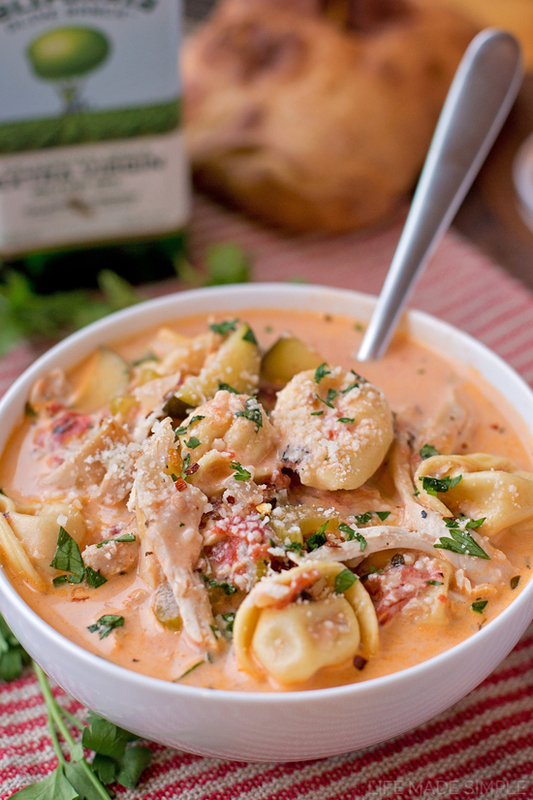 It’s a fall staple and a recipe we’ll keep in our dinner rotation for years to come!! 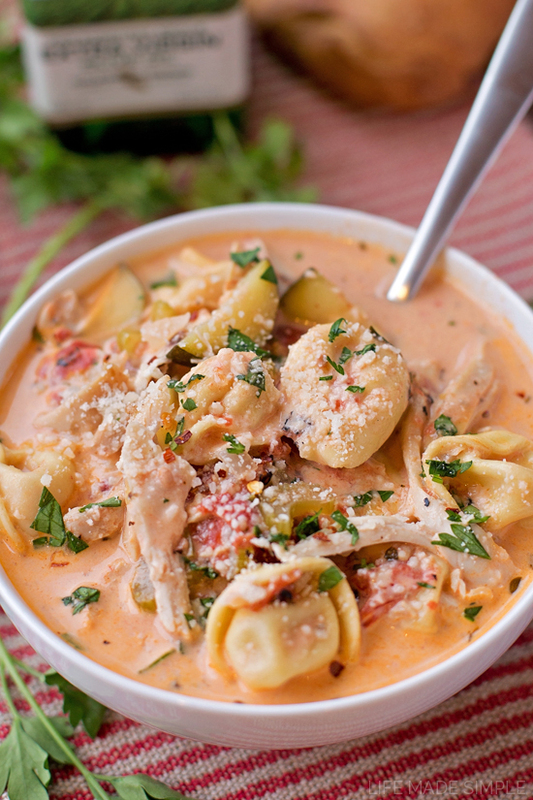 Grab a bowl of this cozy, comforting Italian chicken noodle soup. 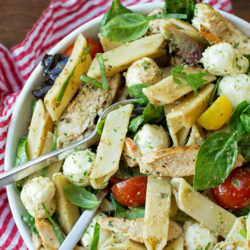 It's packed full of chicken & veggies and tastes great with any kind of pasta! In a large Dutch oven or stockpot set over medium heat, add the olive oil. When the oil is hot add the celery, onion, bell peppers, and zucchini. Cook until veggies are tender, about 5-7 minutes, then add the jalapeño and garlic and continue sauteing for 2 minutes. Pour in the diced tomatoes along with the chicken broth, turn the heat up and bring to a boil. Add the chicken, oregano, salt, pepper and red pepper flakes, reduce heat and simmer for 20 minutes. Add the pasta and cook until al dente, about 10 minutes or so, then remove from the heat and stir in the parsley and cream. Allow to cool for 10 minutes. Garnish with grated or shaved parmesan, serve immediately. *This recipe is great with leftover turkey too!